Adding the Google +1 button to blog posts allows readers to recommend the content on Google Search and share it on Google+. In this article I’m going to explain how to add +1 buttons to the WordPress blog based on iNove theme. 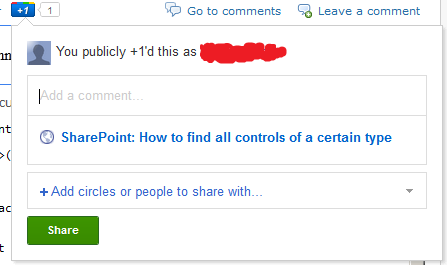 Google +1 button can be virtually divided into two parts: the button itself and a Share bubble. After +1‘ing a blog post, the reader will be able to share the page in Google+ social network through the surfaced Share bubble. Looking ahead, I’d like to note that the most important in the above markup is the attributes, but not the html-tags containing them. I mean the attributes can be applied to different html-tags with the same effect. Ok, let’s add two +1 buttons to every single post page as it’s shown on the picture below: the small sized button at the beginning of the post content and the standard sized one right after it. 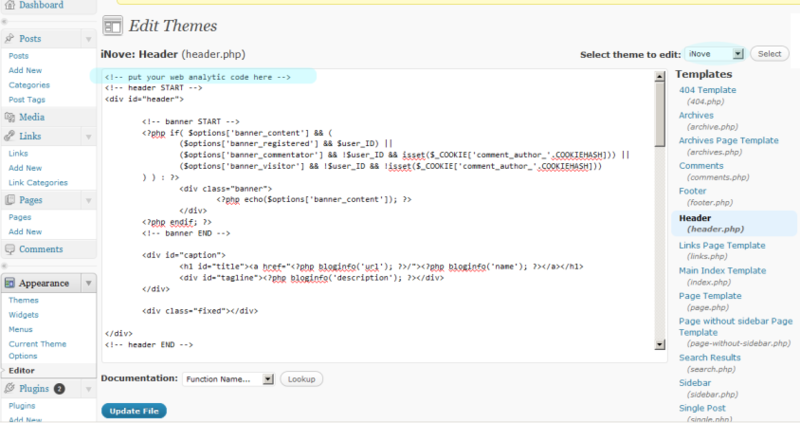 For that, first of all, you need to alter the single.php file (wp-content/themes/inove/single.php). 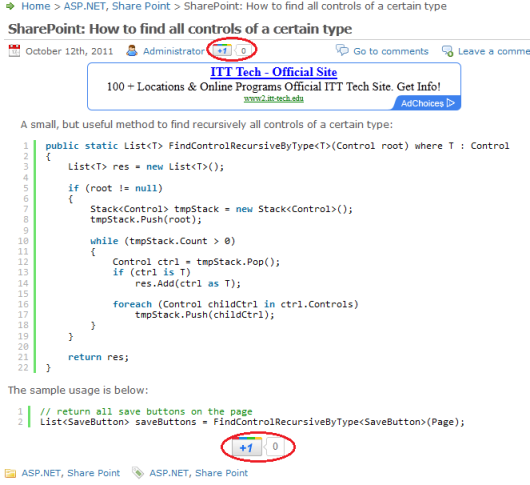 The modification signifies the title for +Snippet will be extracted from the given h2-tag. The small sized +1 button will appear at the beginning of every blog post. Note that, in the listed above code, the the_permalink() function returns the url of the current blog post. This url is used to set the href attribute, which explicitly defines the +1 target URL. The &nbsp; is required, otherwise the brief description will be formed automatically from other sources, mainly from meta-tags and so on. The standard sized +1 button will appear at the end of every blog post. Ok, then let’s make some supporting changes to header.php (wp-content/themes/inove/header.php) and footer.php (wp-content/themes/inove/footer.php). The last step is to replace the old single.php, header.php and footer.php files with the modified ones on your web server. My current theme, iNove, supports web analitycs, but the way described above is too easy for such geek as I’m. I decided to inject web analytics code into the site pages by my own hands. It is known, if you want to have some code inside every page of the WordPress blog, you should utilize such files as header.php or footer.php. Both are included into every page. We can alter them by using admin section. Go to Appearance -> Editor (wordpress/wp-admin/theme-editor.php), select the required theme in drop-down list on the right if it’s not selected yet, then select, for example, header.php, put your web analytics code before the original content and press Update File button. We can do the same through the ftp by locating header.php or footer.php in the appropriate folders. Copy one or another from the web server to the local environment, alter the php file and replace old version on the web server by modified one. Note that in iNove theme the header.php, which is available for edit through the Appearance -> Editor, is situated in the templates sub-folder, while the footer.php is in the root folder of iNove. In the root folder also there is another header.php. Both of them supplement each other, to be more precise the header.php from the root folder includes the one from the templates sub-folder by using the <?php include(‘templates/header.php’); ?> directive. <link rel="stylesheet" href="<?php bloginfo('stylesheet_directory'); ?>/chinese.css" type="text/css"
<link rel="stylesheet" href="<?php bloginfo('stylesheet_directory'); ?>/rtl.css" type="text/css"
<link rel="stylesheet" href="<?php bloginfo('stylesheet_directory'); ?>/ie.css" type="text/css"
An alternative way is to use appropriate plugins. For example, like Google Analytics for WordPress or similar. But besides evident conveniences, the dealing with plugins has some small disadvantages as well. The use of too many plugins may slow down your site. As for me the adding of analytics code isn’t worth having one more plugin, which requires recurrent updates and some kind of maintenance. Using header(“Location: some new url“) method we can transfer user to a new page. Under the hood header() asks browser to make another request for another url. Note that the header() must be called before any text (e.g. HTML tags, blank lines, something forwarded by PHP echo function and so on) is sent to the user browser, otherwise it will not work. That is the major limitation of the given approach we have to be aware of. The first line of the code sample above sends the redirect response code to the browser. Redirect response code is considered as a reason of redirection. You can skip the sending of redirect code. But if you delete or move page to another location, I insistently recommend to send a relevant code, because such codes are being analyzed practically by all Search Engines. Including, of course, the evident leader – Google Search Engine, which examines such codes very thoroughly. The Google PageRank of a page you redirect to can directly depend on the redirect code you return. For instance, in example above I return 301, which means that page was moved permanently to another location that is pointed out in the second line of code. The code 301 also tells Search Engines that link value of the requested url has to be given to the new one. In theory, the new page inherits PageRank of the requested (but absent at the time) page. In reality, it happens not instantly, but some time later. 101 Switching Protocols and etc. 303 See Other and etc. 408 Request Time-out and etc. 503 Service Unavailable and etc. Note again, the redirecting is in the beginning of the file in order to prevent sending any text to the browser. That’s important. OK then, let’s find out what alternative ways to make redirect we have. The first alternative I know is an usage of Html-tag meta with an attribute http-equiv=”refresh”. Meta refresh is a legacy approach, which instructs a web browser to refresh the current page (or frame) after a certain interval. In addition it can prompt the browser to go to a different url during the next page refreshing. The meta-tag redirects a browser to http://dotnetfollower.com after 5 seconds. Meta-tag has to be placed only inside the <head></head> region of Html markup. Inside other tags (e.g. <body></body>) it will be ignored. I think it’s a quite serious limitation. PS There is a function http_redirect. It’s a part of the PECL extension to PHP. Of course, to use http_redirect the extension has to be installed. I believe http_redirect uses Location header as well. If you know other redirection methods in PHP, please don’t hesitate to reveal it here in the comments. 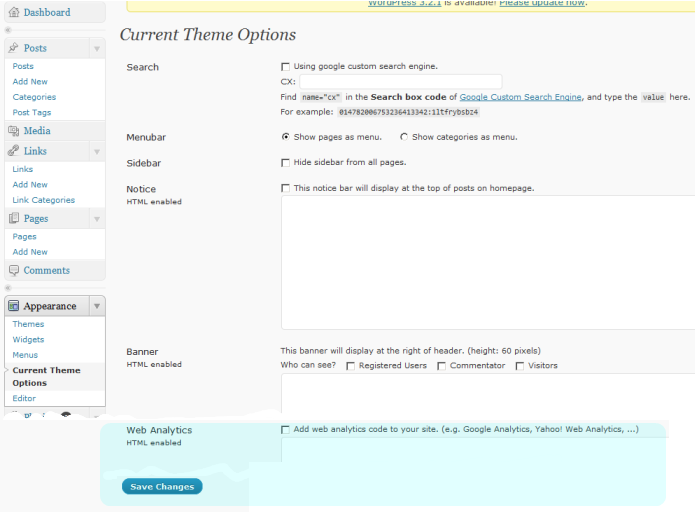 In my blog I decided to use WordPress with iNove theme, and it seems that sidebar of this theme is too wide. I decided to decrease the width of the sidebar by 70px. To do this we should make changes in style.css of iNove theme. Below are the places in style.css where the changes should be done. That’s all with style.css. Also we need to change the image img/sidesep.gif. In my case, I’ve cut off the image at right side from 301px to 231px. That’s all. You can download revised files (style.css and sidestep.gif) here.